Huge thanks and appreciation to The Arioso String Ensemble. The island-based string group played exquisitely at the dinner for VCA’s recent Masquerade auction. Their repertoire includes classical music, waltzes and tangos, fiddle tunes and 40’s standards. They perform on Vashon Island and around the Puget Sound. Sarah Perlman, violinist, teaches violin on Vashon and in Seattle, and performs locally with Rumor Has It. Mary Walker, violinist, has performed with the Thalia and Walla Walla symphony orchestras. 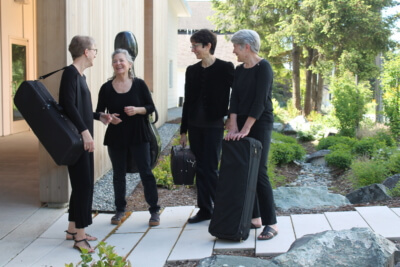 Gaye Detzer, violist, teaches Suzuki violin and viola on Vashon and has performed with Seattle Pro Musica and The Broadway Symphony (see here). Annie Roberts, cellist, teaches cello and piano on Vashon and performs with Orchestra Seattle. They all perform with the Vashon-Maury Chamber Orchestra. Tickets are still available for the upcoming Spring concert is at the The Kay on Friday, 10/26 at 7:30 pm, with a shorter children’s concert on Saturday, 10/27 at 1 pm. The concert includes Carnival of the Animals and highlights Rowena Hamill, cellist, in a suite by Couperin. Casting for Vashon’s Nutcracker was posted yesterday, and many happy dancers went home with big smiles on their faces. We double-cast many of our lead roles so that opportunities for challenges and spotlight are provided to as many dancers as possible. We congratulate all our dancers on their achievements and look forward to bringing the show to the stage. Picture: Mia Giovanna Kuzma in Russian, 2017. 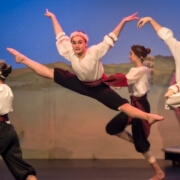 Mia is one of the dancers cast in the role of Sugar Plum Fairy in this year’s production. I wrote about this before. 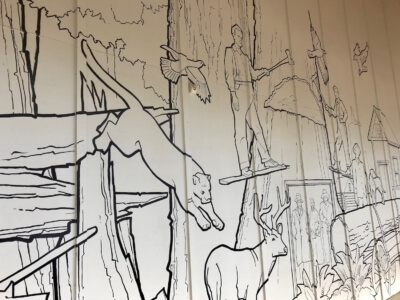 Bruce Morser continues to surprise and delight us with his ever unfolding mural in our breezeway. If you haven’t slowed down or stopped by to take it in, you’re missing something special. We’ll continue to watch and enjoy through til springtime. 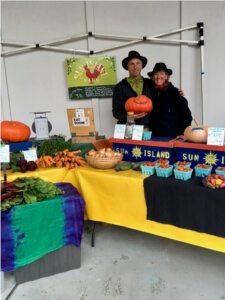 Back by popular demand, VCA will be home to the Vashon Farmer’s Market for its winter markets, October 20th through December 15. Special thanks to the folks at John L Scott for their generous sponsorship of the winter markets. Hours are 10 – 2:00 in our Breezeway and Atrium. Please come see VIGA at VCA! At this point word has leaked out, so I might as well be loud and proud to tell you I and a guest star are performing at Voice of Vashon’s 4th Birthday bash Lip Synch Battle. Here are the details. Come and down and clap like crazy while we all support this vital partners and island resource! It’s a reboot by popular demand – It’s the KVSH Birthday Bash & Lip Sync Battle. Last year was so much fun, we’re doing it again – for all those folks who were inspired by last year’s show and those who are itching for a comeback. Island officials, celebrities and rock star wannabes are polishing up their air guitars again for VoV’s Fourth Annual KVSH Birthday Bash and Lip Sync Battle, Friday, October 12, at the Red Bike. Dynamite host Arlette Moody returns to set a raucous tone for the night. And, the night will be filled with riotous musical interpretations starring the people you see or hear from regularly…in a whole new light.
. . . I’ll leave it to you to decide which category into which I fit! We’re definitely doing one of these three songs. Watching Bruce Morser work reminded me of Dutch phenom Max Zorn, who with nothing but packing tape and a scalpel makes stunning art. Check out these videos . . .
Clearly Max is crazy talented. What I like is the reminder that we can see art everywhere and we can make art with anything. Do what you love. Do it artfully!